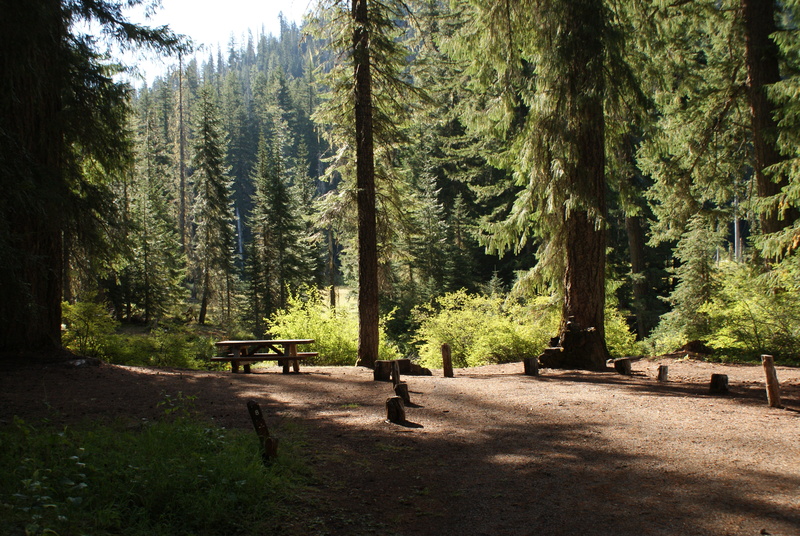 Hamaker Campground is off the highway down a gravel road, and doesn’t get the traffic that the larger campgrounds on the Rogue receive. 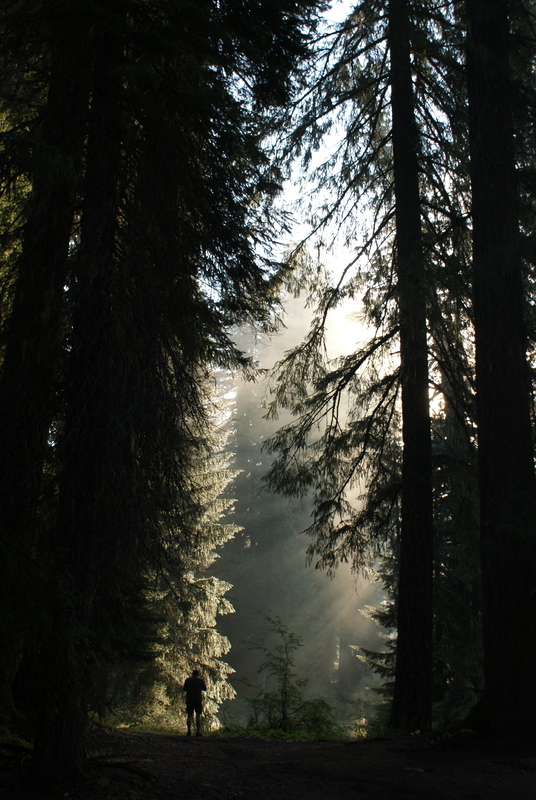 It’s quiet and peaceful, tucked away in a valley of old growth firs. There are only 10 campsites; for most nights, there were only one or two other sites that were occupied, and one night we even had the whole place to ourselves. 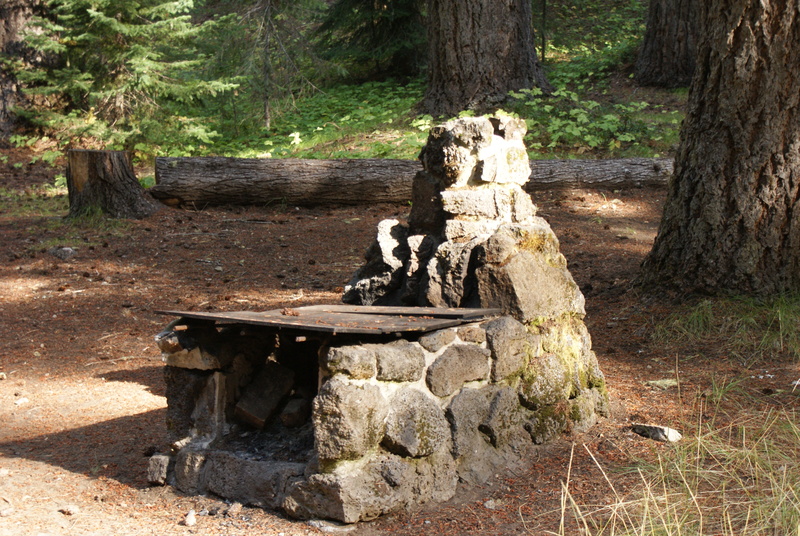 The sites each have an old CCC-era stone fireplace that used to be used for cooking. Most of them, sadly, have deteriorated beyond usefulness. 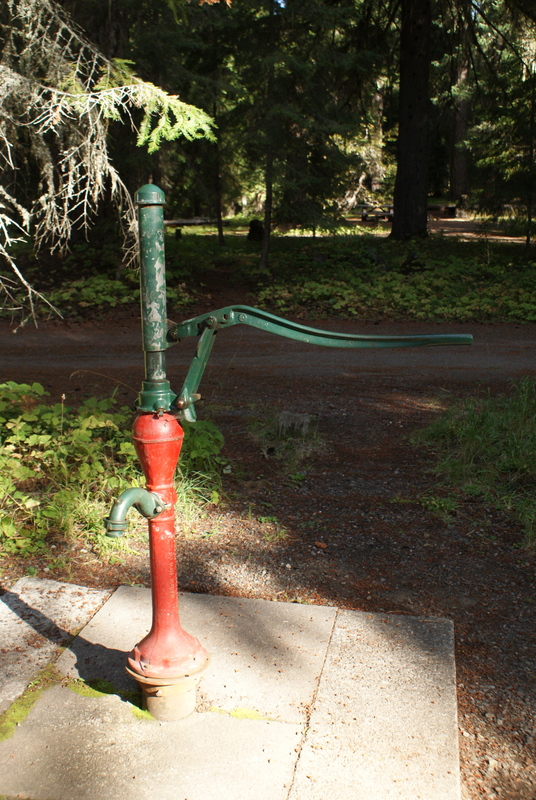 You get your water from an old-fashioned pump – it’s clean and clear and tastes wonderful. Many of the sites are large, and a few sit right on the river. A couple of meadows are across the river, normally populated by cows grazing the summer grass. There are some big old stumps for kids to play on and around, and the loop is fine for endless circles on a bike. We set up the big and little tents for us to sleep in, and my parents had the trailer. We didn’t use the rain flies for the first two nights, since it was so warm and the moon was lovely. On the third morning we woke up early to raindrops hitting us, and had the flies on in record time. On Wednesday night there were thunderstorms, so we slept in the trailer. It rained very hard on Thursday, but our tents stayed remarkably dry, just soaking through a bit along the poles after many hours of rain. The tents for some reason were very attractive to bees and hornets. 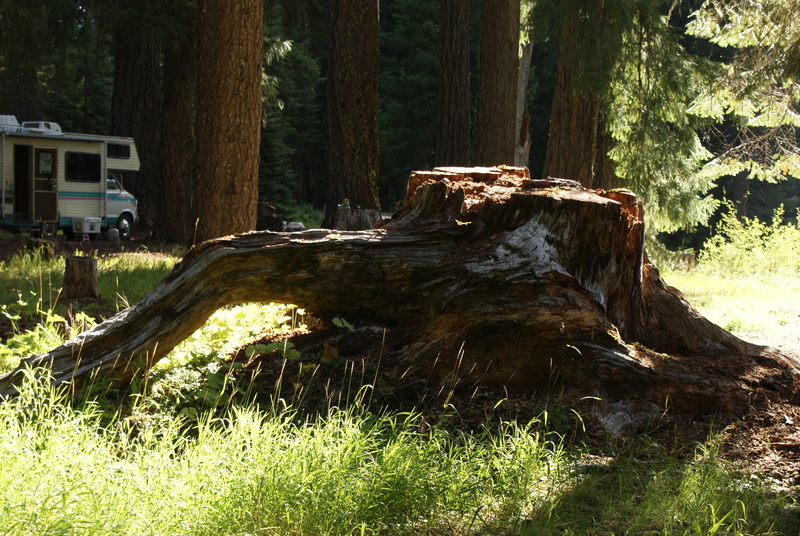 We arrived on Monday afternoon, and were disappointed to learn that we wouldn’t be able to have campfires due to the extreme fire danger in that part of the state (the hosted campgrounds down the road did allow campfires, though). We went out the first evening to star gaze, but the full moon was so bright that it washed out all but the brightest stars. I have memories from my childhood of lying in the meadow and looking up at a sky full of brilliant stars, the most I’d ever seen. It turns out that we didn’t get a good star-gazing night the whole week, due to the full moon, clouds, rain, and smoke from forest fires. The yellow jackets were pretty thick during the week, and the bald-faced hornets were, too. We were amused lying in the tent during the day, watching the hornets come in under the tent fly and catch black flies to eat. We had an uneasy truce with them, and were grateful we had a sheltered place to prepare and eat our meals. Dad also had a screen tent we could use to sit outside with less annoyance from bugs, though the bees did occasionally manage to make it inside the net. On Tuesday we went for a drive. 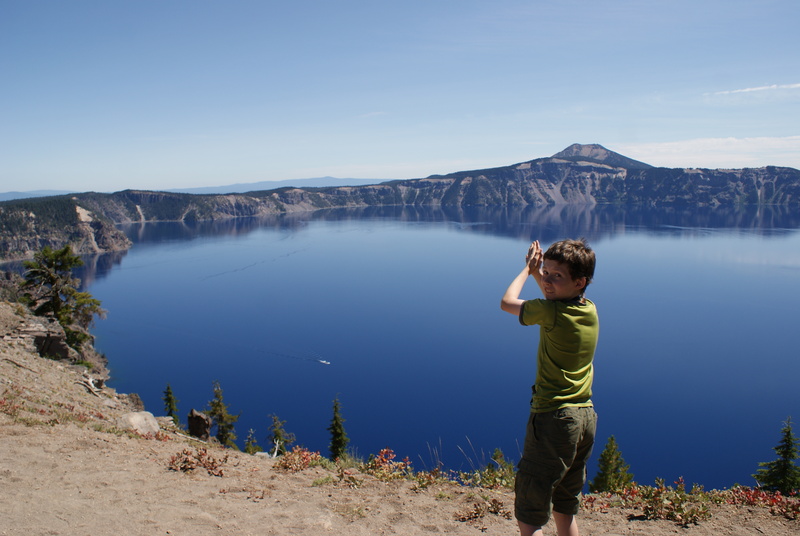 We packed our lunches and snacks, and drove up and around Diamond Lake to see what it was like, and then went up to the main attraction, Crater Lake. 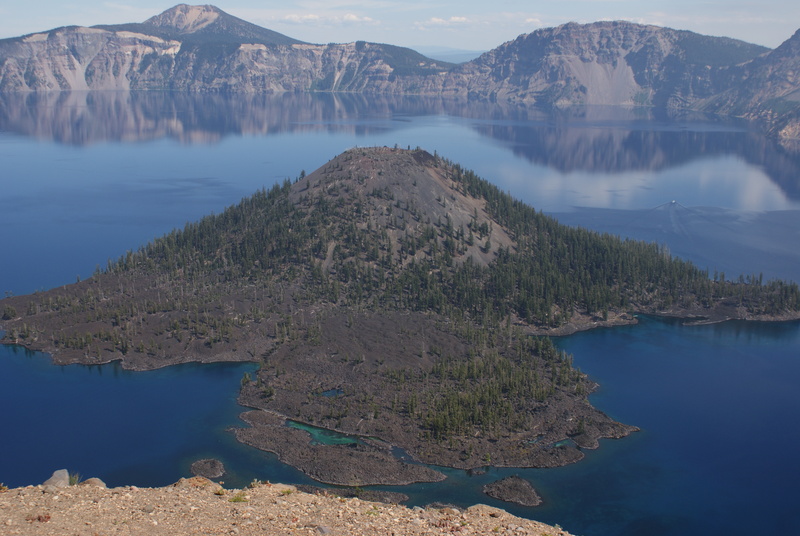 We came in from the north, and I remembered that first viewpoint as you come in from the Pumice Plains, up a sandy bank, and then suddenly that deep blue lake is right below you. 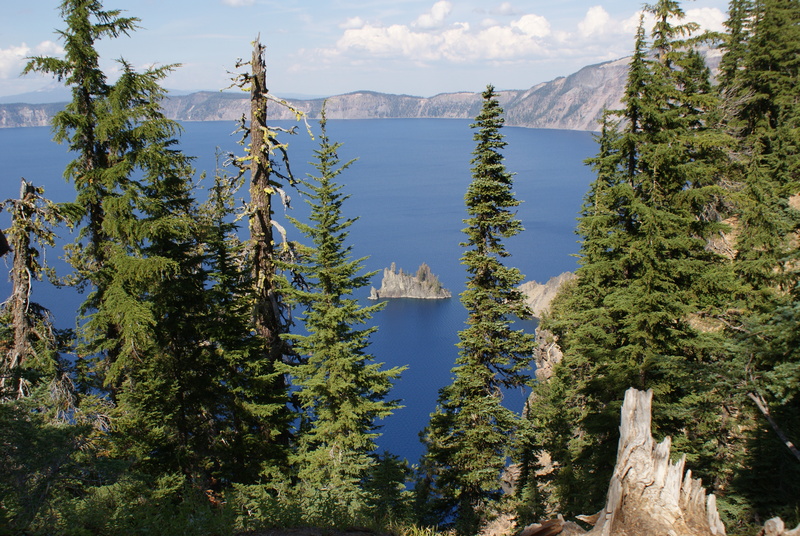 After soaking up the views, we drove over to the Rim Village area, where we fixed a lunch at the picnic area and managed to hit one of the ranger programs. We learned about the endangered Red Fox that has been showing up recently in the park. 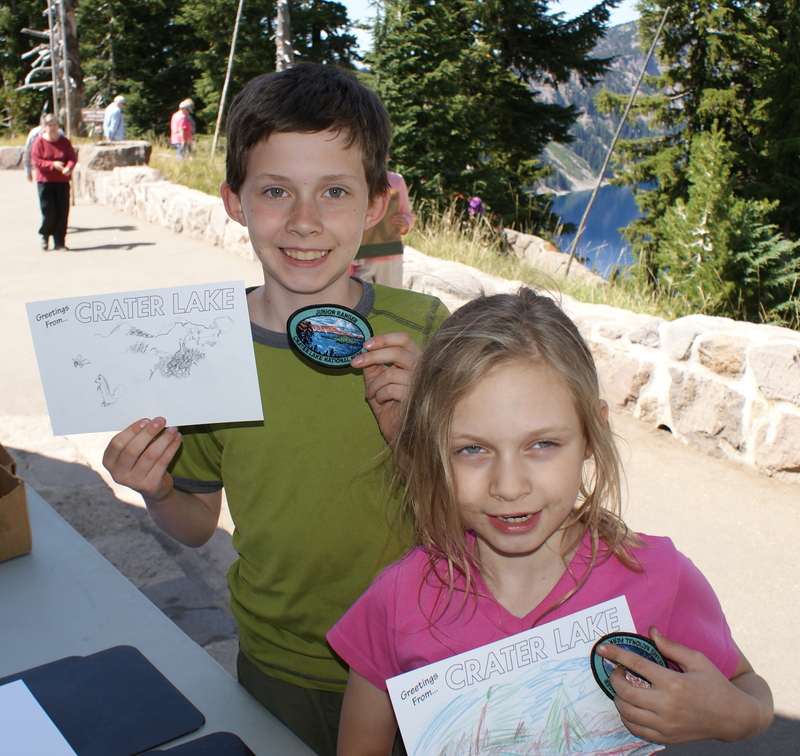 The kids also did an activity with another ranger to earn their Junior Ranger patch. 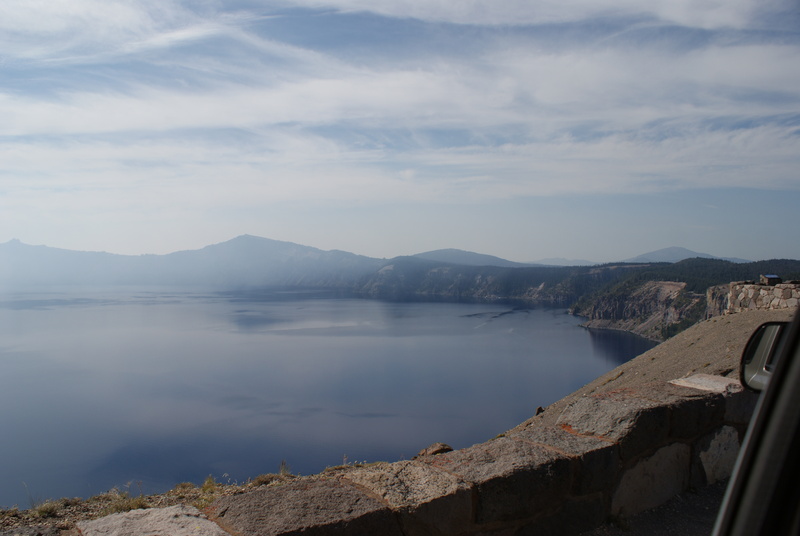 We enjoyed the view from the viewing area, straight down to the amazing cerulean waters. Then we started a drive around the Rim. We had a book that my mom bought from the gift store that detailed the drive, describing where to stop to look at interesting views, and talking about some of the geology and history of the lake area. I really recommend the book, it makes the drive pretty interesting and points out details we would have missed otherwise. 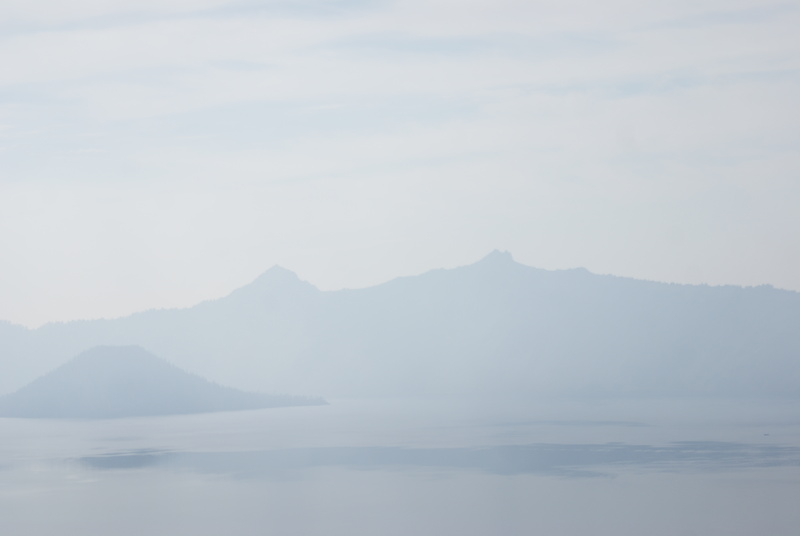 While we were driving, we noticed smoke from forest fires in the Medford area beginning to encroach on the lake. First it filled the valleys to the west, cutting off the views in that direction. 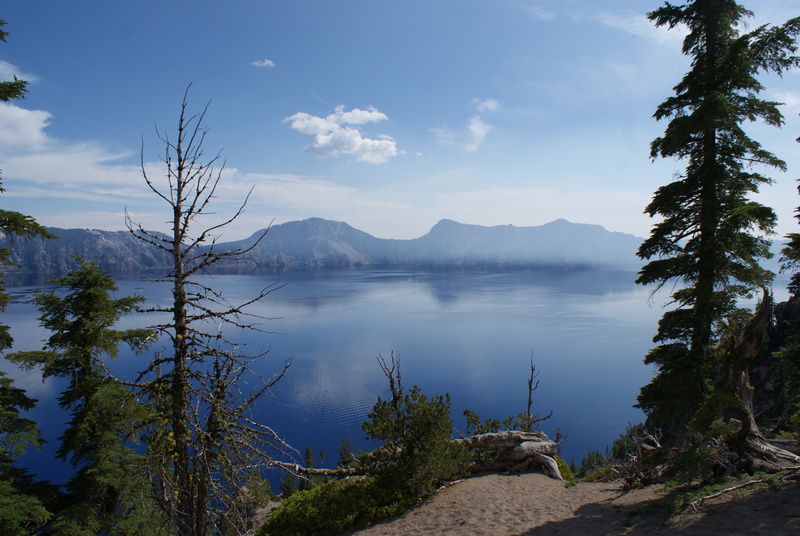 Then it hit the western rim, and we could see ripples on the lake as the wind picked up, and we watched the smoke fill the 6-mile-wide lake basin from west to east. We had been concerned that this might happen, and were worried about my Dad’s lungs. But it was quite a sight to watch the far rim disappear throughout the afternoon. Since the smoke was so thick, we decided to return back to camp instead of completing the Rim tour. We did make a detour down the road to the Pinnacles, which were an interesting side trip. Smoke was not as bad in camp, thankfully, though we could smell it. 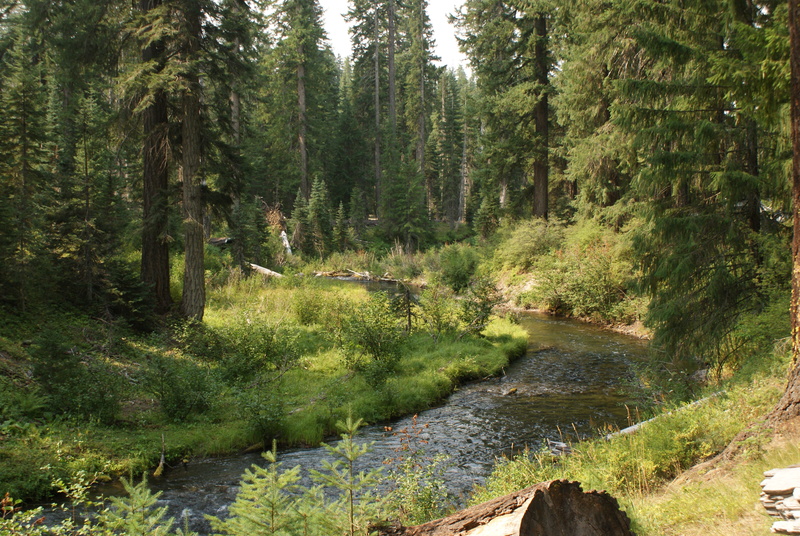 We spent a lot of time on Wednesday resting around camp, and exploring the campground and the meadow across the river. The kids had fun catching grasshoppers over there. A red-tailed hawk made his home somewhere near the meadow, and we saw and heard it multiple times during the week. The ospreys that were there last time did not make an appearance. The kids did a lot of bike riding around and around the loop, and Gabe and Aaron at one point took a longer ride on the gravel atv roads in the area. 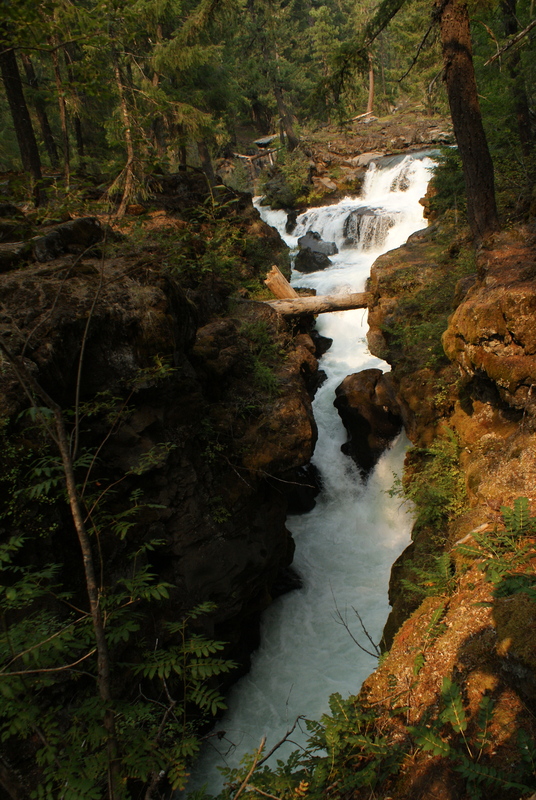 On Wednesday afternoon we took a drive down to Union Creek to see the Gorge. 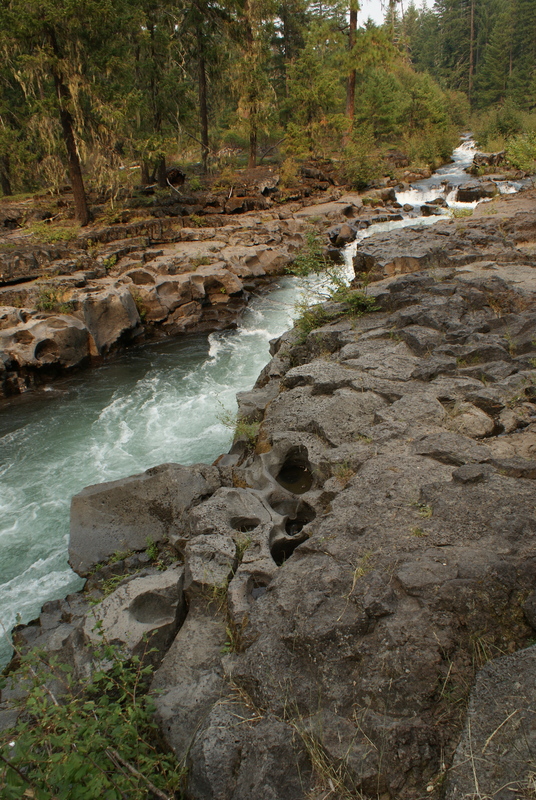 The Rogue River slices through a lava flow, making a narrow and scenic stretch of river. There is a paved trail with interpretive signs that you can walk to get a good view. 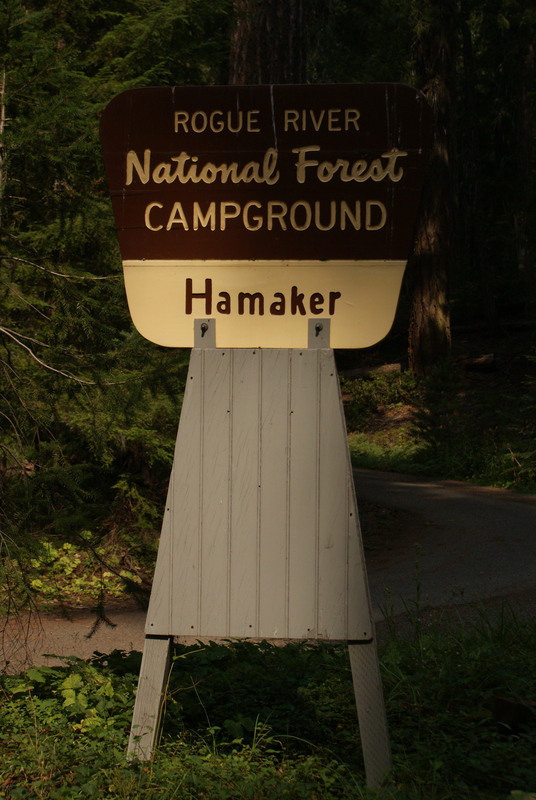 We also enjoyed driving through the two campgrounds in the area, scouting them out and comparing them to Hamaker. They actually looked pretty nice, weren’t full, and would meet our criteria for camping spots if Hamaker weren’t available. The smoke was worse down there, though. 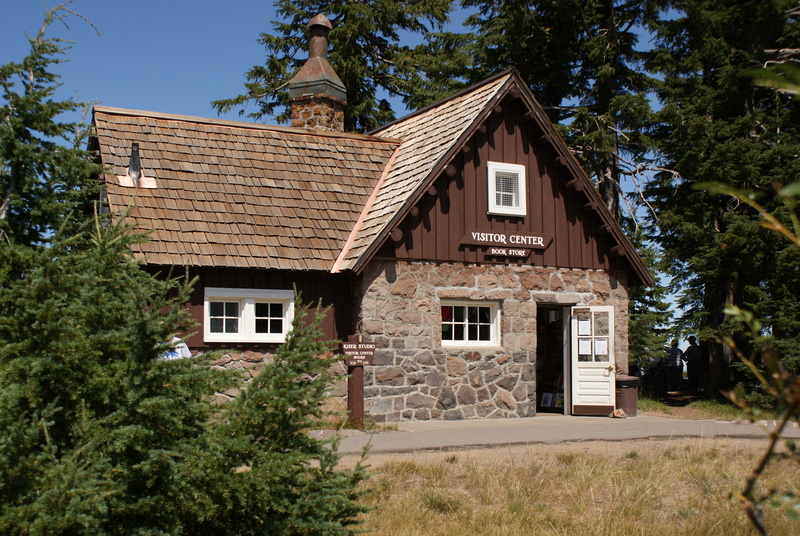 We stopped for yummy ice cream in Union Creek, too, where there are a few buildings – a store, an ice cream store, and a restaurant, as well as some cabins. On Wednesday evening, we roasted marshmallows for s’mores on the gas stove, getting a few servings in before a big thunderstorm started. We slept in the trailer that night instead of the tents. The sun came out the next morning, but we ended up with more thunderstorms in the afternoon. They died down by evening, so we slept in the tents. They had stayed dry even through the pouring rain. I had a big rip in my Exped mat, though, which required patching. Not sure how that got there, but it seems to be fixed all right. We were hoping that the rain would mean they’d lift the fire restrictions, but when the campsite concessionaire came through on Friday, he informed us that the lightning had started 26 new forest fires, so there would be no campfires for us. 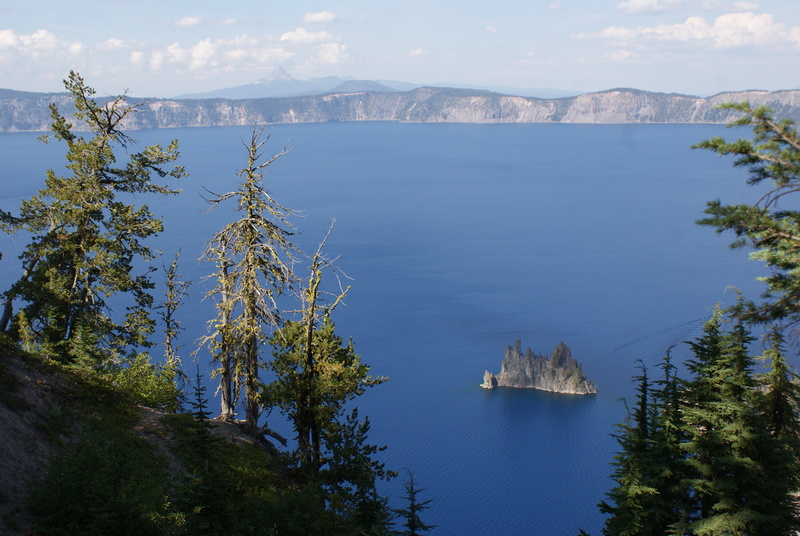 On Friday we decided to take one more drive to Crater Lake to see what we had missed the first day. I was glad we took the time to do this. 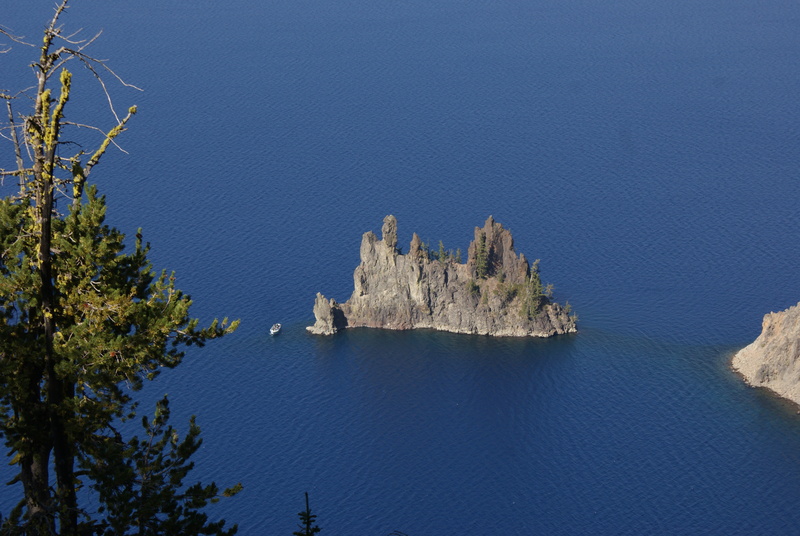 The smoke had cleared, and we got some great views of the Phantom Ship and the lake, plus got to walk on a couple of the nature trails and see the late-season wildflowers. 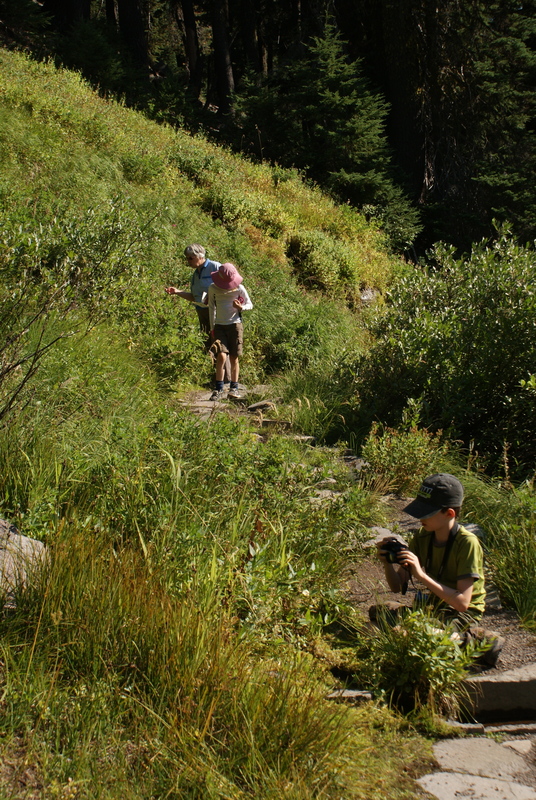 We enjoyed the Sun Notch trail and the Castle Creek Wildflower Trail. On Friday afternoon we got as much packed up as we could ahead of time so it would be easier to get out of camp in the morning. We were sad to leave this special place on Saturday, but we were also ready for showers and our own beds. It was a long drive back up to my parents’ but the weather was fine for driving. I really enjoyed this trip with the whole family, including my parents. 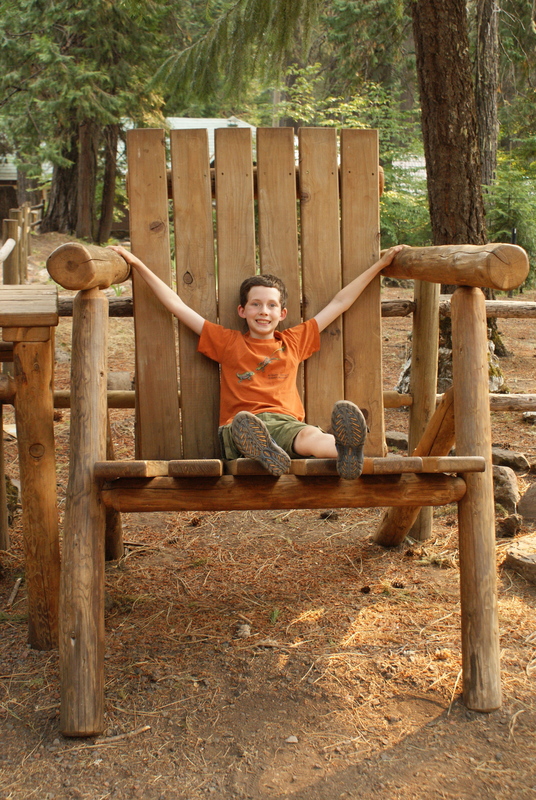 It was so cool to relive childhood memories and to share these places with my own children. They’ll have a different set of memories than I do, but I hope they’ll realize what incredible places they’ve gotten to see.